I have the 5764 "Rescue Robot" from the Creator line. The light brick is cool, but always needs to be pushed in to light up. Are there any bricks that have an on/off switch or other mechanism so they stay on without being constantly pushed by hand? By late 1958, the LEGO parts pack number 245 was used in all these countries (including Italy, which started LEGO sales in 1958) until 1965. This same brick was sold under different pack numbers (445 in UK/Australia, 485 in continental Europe) until the late 1960s, when it was rreplaced with the 995 Lighting Brick Parts Pack... and later others lighting bricks parts packs (such as 970 in the late 70s). Here is an image of the parts pack box of the first lighting brick... 1245 from 1957-58.... with Danish writing "System i leg" = "System in Play" on the box top. All the box tops of the late 1950s show the the 3 children of LEGO managing director Godtfred Kirk Christiansen (later sole owner of the company)... from left to right... Gunhild Chistiansen Johanson, (the late) Hanne Christiansen, and Kjeld Kirk Kristiansen (KKK). Can the current light bricks have the battery changed out? It looks like they might be able to, but I have not tried. Hope someone else has attempted. I know the original Space Police offerings included the SP Striker, which included a 9V battery brick which would allow different pieces with lights built-in to light up. According to one of the reviews, you could set the lights to flashing or solid - I'll have to take their word, as I never had that particular set. 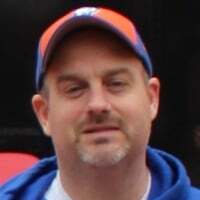 I believe you are talking about http://www.bricklink.com/search.asp?q=4760. You can turn the lights around and they will flash or stay solid depending on which way you have them turned. You can change the batter in the light up brick, but you'll need a screwdriver and the battery is one of those special watch type batteries. With the current light brick, you can build a structure around it that would push against the button and thus free your hand from keeping the brick lit. I'm sure using standard bricks a creative solution can be found if you're using it in a MOC. 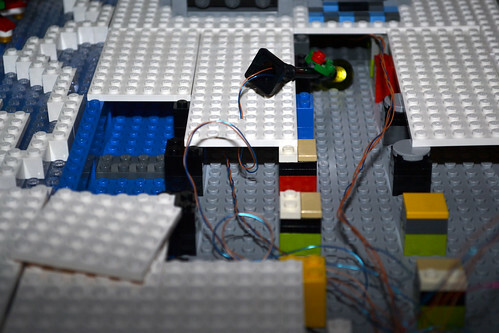 And finally, a more flexible and durable lighting solution for your creations is just to use the Power Function Light Set: http://www.brickset.com/detail/?Set=8870-1 This really is a good solution. The battery box (sold separately) uses common batteries and has an on / off switch. You could use an IR remote switch for you lights if you wanted to. You can get multiple sets of lights and wire them to the same battery box. The light tip fits into the hole of a technical brick or similar sized hole, so you can easily position the light in a variety of ways. Finally, if you want to add color you can put in translucent pieces in front of the light to act as a color filter. The biggest drawback is size. The battery box is large and so it might be a challenge to incorporate it into the model. And you have to run wiring through your model, which might be a challenge. Thats one of the best things about this forum when compared to many forums of all sorts of different things. Here you get useful intelligent well thought out answers that have the stuff you want, links, and some other cool details as well. Remember there are two non-rechargeable PF battery boxes now (as well as the very pricey rechargeable one). The new train-centric one is the same size as the rechargeable one and uses triple-A batteries (I think - that is from memory from when I built the two new train sets last year) rather than double-A and so it is bit more compact. Plus it's brick-like shape may mean it is perhaps easier to integrate into some models. A couple quick questions, has anyone made any mods to keep the lights on all the time? If so how did you do it? Also, Anyone who has have any idea how much time/battery life you will get? 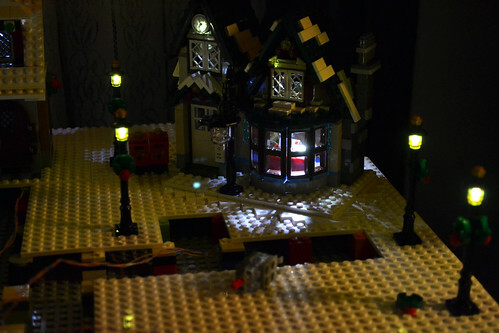 I have the christmas sets displayed and it would be nice to keep lights on. I know I could tape or something but I thought maybe there was an easy way to do it and not leave marks on the brick. Thanks. I've been pondering over this for a while, and the best way I've come up with is plates on the top and bottom, sticking out past the button, and a brick between them holding it down. I haven't physically tried it yet, but mentally that seems the best. 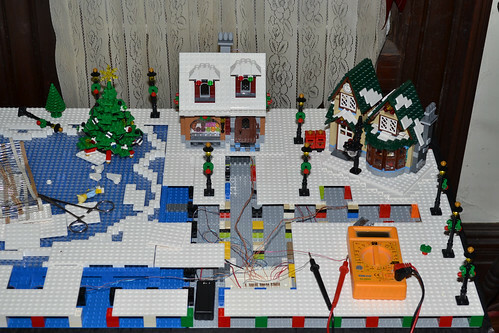 You might also want to take a look at lifelites, I'm considering them for my Winter Village. they could serve as a switch. The Toy shop has this built in, all you have to do is rotate the light upward and the technic shaft in the back hits the roof keeping it on. The bakery doesn't have this so you would have to make something for it. I have not built the Post Office yet so I don't know about that one. The thing I don't like about the Lifelites is the digital glow they leave, it isn't warm, too cold looking. I have used Lego 4.5v lights in some of my buildings that do look more natural. The guy who made it also sent me some 'behind the scenes' photos, of how it's wired in, which I can forward if you give me an email address. I'm in the middle of putting together another Christmas layout. Hopefully it will be done within the next couple of weeks. One thing I've noticed about the LEGO lights is that they get considerably dimmer after being on for a few minutes... That and I have no interest in replacing those silly batteries they have. I also didn't want to spend a silly amount of money on LifeLites (which are nice, but terribly expensive if you want more than a couple). They're blindingly bright when you operate them at 4v - and they're still plenty bright when you use a 3v supply. It's also hard to go wrong at 36 cents a piece. ^ thats actually the route I was thinking of going, I am an electronics tech after all, I should be able to wire up some LEDS :-). I will also post pictures of my layout when I am done. Speaking of, is there such a thing as a white baseplate? If so what sets was it in? ^ Hoth Echo Base comes with 4x white 8x16 plates. Some Ferrari sets came with white 16x32 and 32x32 baseplates. ^^I was looking at one of the LUG's flickr (I think it was NY) and they had ordered white 32x32 baseplates in bulk. @pantenkind @kylejohnson11 - It was probably ILUGNY's 2011 LUGBULK order. I didn't go the baseplate route - partly because I'm unwilling to wait for LUGBULK, partly because I had to make a substructure for my winter village. Instead, I ordered 300 6x6 white plates from PAB online. Pricey, but well worth it. I laid everything out on a variety of baseplates, then put down two layers of 2x2 bricks 4 studs apart. The result is a false floor (much like how wiring is routed in a server room) . This allows me to hide all the wiring, and it looks quite nice. I also drilled a small hole in the center of a few of them so I could route the wiring for the brickforge lamp posts. I'm wire-wrapping everything instead of soldering (partly because I can wire-wrap in close proximity to the LEGO without any danger of melting). I might use some hot glue to insulate the leads on the LED's. Currently I'm using a pair of AAA's to power it, but I plan on using a 3v 300ma adjustable power supply, and everything is plugged into a pair of solderless breadboards (one on each side of the layout). ^ @jwsmart Great ideas for the smaller plates, also for the false bottom like a server room. I knew I was going to have to do something similar to hide the wires. I picked up all my wiring and leds today and I am going to order a p/s in the next day or two. Wire wrapping is also a good idea, I was trying to think how I was going to wire up the leds inside the small lego bits. Anyways, I plan on taking some pictures of the process. Maybe between the two of us and this forum we can come up with the perfect way to do it. I just recently learned that this is basically what they do in dollhouses (except it's covered by wallpaper). I'll post some pictures of "2.0" this evening. Right now, I think the LED's I have are nearly ideal, when they're run at the proper voltage, they're way too bright, but I'm running them at about 75% of the "typical" forward voltage listed in the spec sheet - and as a result they're drawing less than 10 mA each - which is fairly important, because I'm planning on having 30-40 of them in the display. I still need to work on the connectors. The solderless breadboard is easy, but isn't ideal. I'm having trouble finding connectors that don't require a $800 crimp tool, will fit in a 4.8mm diameter hole (technic), and will accept 28+ AWG wire (wire-wrapping wire). Lastly, I need to figure out how to add some sort of microcontroller. If the current draw of the LED's is low enough (< 20-30mA), I could drive them directly off the outputs of most cheapo microcontrollers, but I'd probably want to add some sort of buffer in there. Anyway, my point is there's plenty of room for improvement. "Right now, I think the LED's I have are nearly ideal, when they're run at the proper voltage, they're way too bright, but I'm running them at about 75% of the "typical" forward voltage listed in the spec sheet - and as a result they're drawing less than 10 mA each - which is fairly important, because I'm planning on having 30-40 of them in the display." This is why I am going the power supply route as opposed to just batteries. You need alot more control over the voltage and amperage you send. I am also dreading drilling out the small holes needed to run the wires. The single lamp will not be bad but that double lamp post will be a bit trickier for sure. ^ What are you planning on using for a power supply? I have an old 300ma 1.5 or 3v "adjustable" power supply I'm going to use. Unless you're going to build or buy something that's really adjustable (3.5v would probably be ideal for these LED's) If you look on the spec sheet for the LED's I linked, the current ramps up very quickly as you increase the voltage. If you have a power supply, the voltage won't drop over time like with batteries, but otherwise it should all be the same. More expensive, but so much easier to work with, and they look quite nice. Pictures, as promised. It's still very much a work in progress. You can adjust the brightness by changing the value of a resistor in series with the LEDs. Take the nominal voltage drop of the forward biased LED and subtract it from the supply voltage. Divide that by the desired current to give you the resistance needed. Then select a resistance value close to that. Most LEDs are full brightness at about 20mA if I am not mistaken, check the spec sheet for what you have to be sure. @fox171171 - While that's an excellent tactic for single LED's, it becomes a little less ideal at scale. I have at least 35 LED's connected. Let's assume that I want to drive my LED's with 10mA at 3.3v (These LED's, at full brightness are extremely unpleasant to look at). Then you need to worry about the power dissipation of each individual resistor (is it within 50% of the the resistor's rated power dissipation? ), etc. This is why I want to look into LED drivers for next year, from what I can tell, they're constant current, adjustable voltage. Anyway, that's for next year. Reading this thread makes me wish I wasn't prone to accidently starting small fires ;) @jwsmart - layout looks SO amazing lit up! Nice Work!!! giving me so much to think about... especially digging the lighting with the skating pond! @Savage_Steel - Don't feel so bad. Last year, I started in October, and managed to make five lamp posts, which were very dim. This year was the second time I started in late October, and I put too many weekends into this. @jwsmart - I may have missed it but what is the gingerbread house looking structure just to the left of the lake? @Bosstone100 - it's a MOC. I'm calling it "Winter Village Tavern". I have more pictures on flickr... Maybe. Eventually, I'll take better pictures and post them on flickr. Did you design it in LDD? 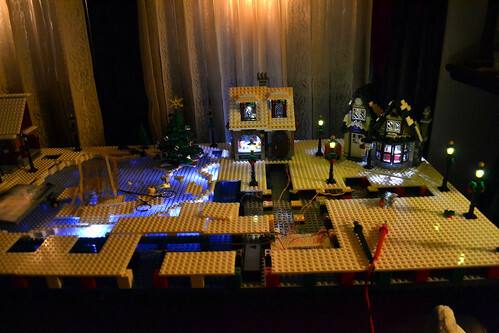 monkey_roo also did a tavern for his winter village and it looks great. I want to expand mine too. Not sure what sets would be best to use for parts. I did pick up a MMV set because it has some structures that look winter villagy. @jwsmart That's a gorgeous scene. @Bosstone100 - Nope. No LDD yet. I got my hands on a pair of Winter Village Bakery cheap, and started with that. After this comes off display (sometime in January...) I'll do the full LDD treatment. I just built the Winter Post Office. Is there any way that the light brick can stay lit? It seems a little odd to me that if I want the light on (while on display) that I have to push the little red pin to light the brick. Is this going to be the same when I build the bakery too? You can use two complimentary hinge pieces and attach it to the light brick. Then flip the hinge until it presses against the switch. It should be able to stay in that position by itself. I've used a 2x2 plate overhanging by 1 stud and a 1x2 brick fixed to it by it's top. But if I'm wrong, you can always buy a new light brick off of eBay or BrickLink. When in emergency ask an adult for help ;) so my dad finally managed to unscrew it. It's drying now and will probably be alright. Thanks. That was a stupid question but I got scared - losing my only light brick meant no more cattle mutilation by aliens. losing my only light brick meant no more cattle mutilation by aliens. I'm intrigued - why did it go underwater in the first place?